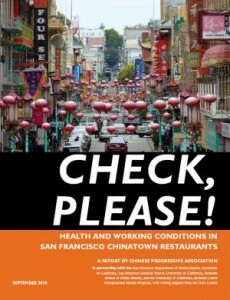 The Chinese Progressive Association(CPA), with support from the DataCenter, released the groundbreaking report that documents the working and health conditions of San Francisco Chinatown’s restaurant workers. This report, based on surveys of 433 restaurant workers interviewed by their peers and observational data on 106 restaurants, found a prevalence of low-road industry practices such as wage violations, lack of benefits, poor working conditions, and stressful and hazardous workplaces. These conditions leave workers insecure in their jobs and vulnerable to injury and illness, while negatively affecting consumers, businesses, and the community. The problems in Chinatown reflect a national epidemic of wage theft and lowered labor standards. The report concludes with a series of recommendations to address working conditions for restaurant workers as well as all low wage workers.